To compassionately serve the needs of the hungry in Sweet Home by providing food, information and supportive services in an efficient manner through caring community partnerships. 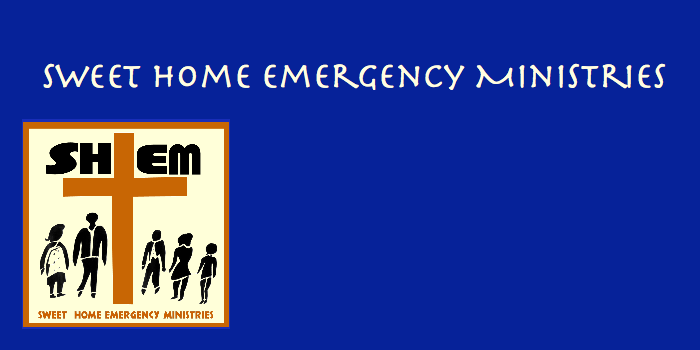 Sweet Home Emergency Ministries was founded in 1980 as a non-profit agency under the supervision of the Sweet Home Ministerial Association. In 2007, Sweet Home Emergency Ministries filed with State of Oregon for incorporation as a domestic non-profit corporation and received notice of its 501 (C) 3 tax-exempt status. For any other information dealing with Supplemental Nutrition Assistance Program (SNAP) issues, persons should either contact the USDA SNAP Hotline Number at (800) 221-5689, which is also in Spanish or call the State Information/Hotline Numbers (click the link for a listing of hotline numbers by State); found online at: http://www.fns.usda.gov/snap/contact_info/hotlines.htm. To file a complaint of discrimination regarding a program receiving Federal financial assistance through the U.S. Department of Health and Human Services (HHS), write: HHS Director, Office for Civil Rights, Room 515-F, 200 Independence Avenue, S.W., Washington, D.C. 20201 or call (202) 619-0403 (voice) or (800) 537-7697 (TTY).